Last year, 2015, marked the twentieth anniversary of disruptive innovation – introduced to the world by Clayton Christensen in 1995. Over the past two decades, many companies and makers have targeted the creation of new-to-the-world products. This has resulted in a number of approaches that are all disruptive in their own way. 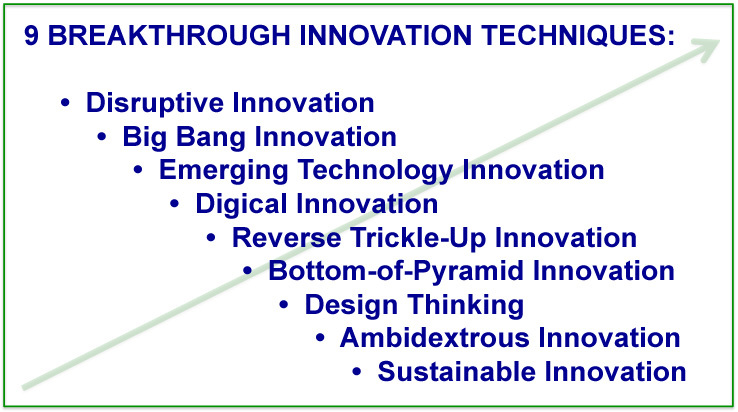 At this time, nine different techniques for achieving breakthrough innovation exist. GGI performed secondary research to identify these nine techniques. Our scan covered a number of notable periodicals including: Harvard’s Harvard Business Review, The Economist’s Chief Financial Officer, MIT’s Sloan Management Review, IRI’s Research & Technology Management, IEEE’s Engineering Management Review, IEEE’s Transactions on Engineering Management, ASEM’s Engineering Management Journal, PDMA’s Journal of Product Innovation Management, PWC’s [formerly Booz’s] Strategy+Business, and other publications. Breakthrough Innovation: Nine Techniques [Machine Design – May 2016] gives a one paragraph description of each technique and provides active links to selected sources and writings for the reader to explore. This entry was posted on Wednesday, April 20th, 2016 at 10:49 pm	and is filed under Research, Strategy, Tactics, Tools & Techniques. You can follow any responses to this entry through the RSS 2.0 feed. You can leave a response, or trackback from your own site.